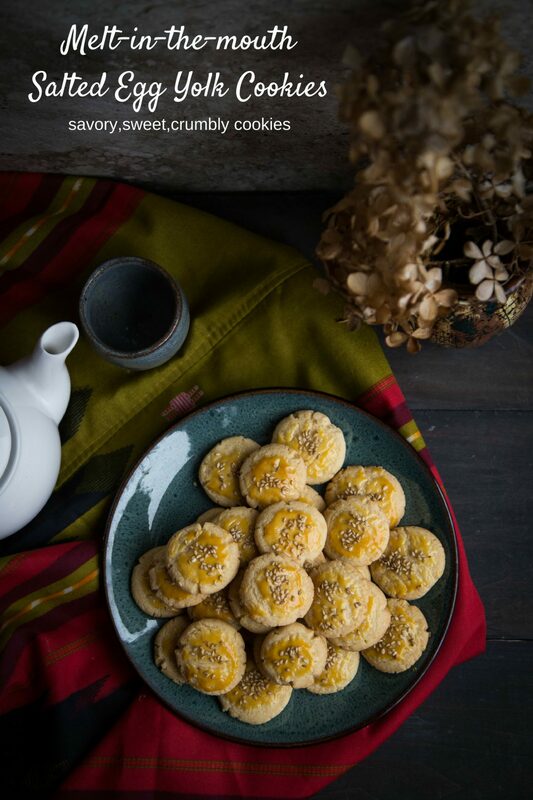 Salted Egg Yolk Cookies – Soft buttery cookies are infused with the salty umami salted egg yolks to give you sweet, salty, and crumbly cookies. 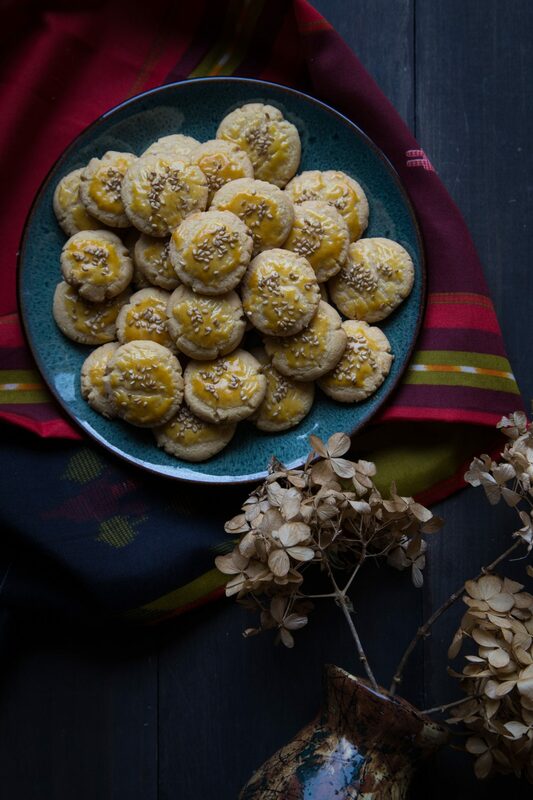 One of the popular cookies for Chinese New Year celebration. I remember mom told me that Singapore was salted egg yolking pretty much everything edible these days 🙂 I thought it was funny when she said that. But she admitted that she liked it! Salted egg yolk chicken, salted egg yolk prawn, salted egg yolk steamed buns and I believe many more. 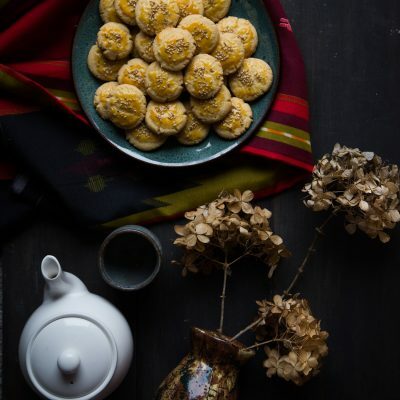 Salted egg yolk is very well loved in Asia. Usually duck eggs are cured with salt and the yolks turn bright orange red in the end resulting in very salty whites and salty and slightly sweet yolks. Usually the whites are not used much in cookie making. The whites are extremely salty and so it’s suitable to pair with a bowl of homemade rice porridge/congee. A while ago I learned how to cure chicken eggs so I can use the egg yolks. The yolks of chicken eggs won’t be as vibrant, however, it gives pretty similar results. Fresh duck eggs are super difficult to find here! Sadly! They have them once in a while at the Farmer’s market, but not always! 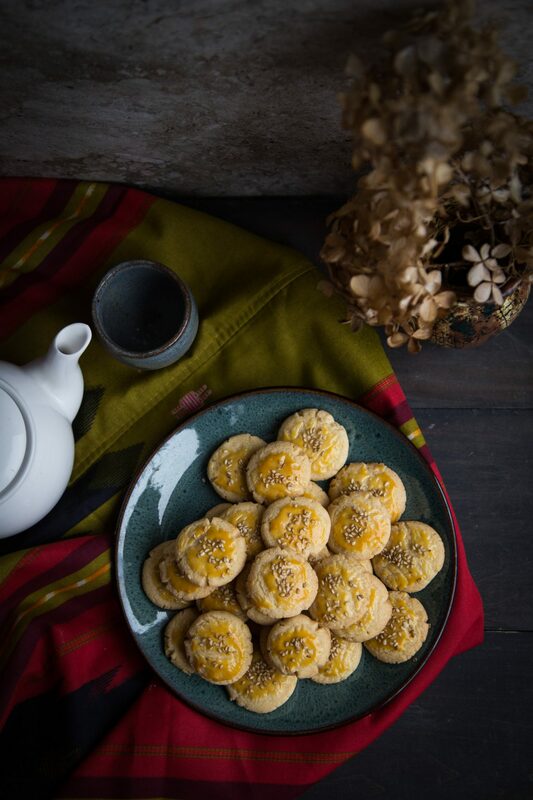 These salted egg yolk cookies though…YOU MUST TRY! especially if you like savory and sweet on cookies and dessert! I love the savory and sweet combo! 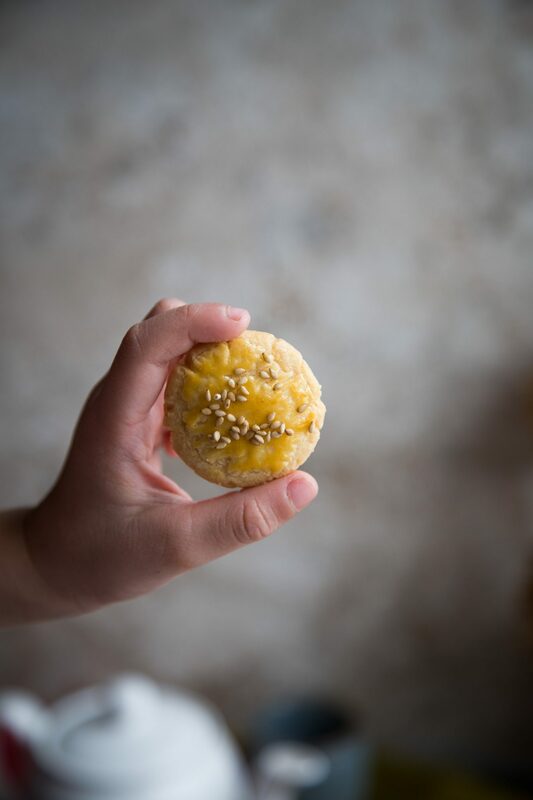 These cookies are crumbly and savory and sweet…mmmm….you get the picture! (or you don’t! ha..ha..!). 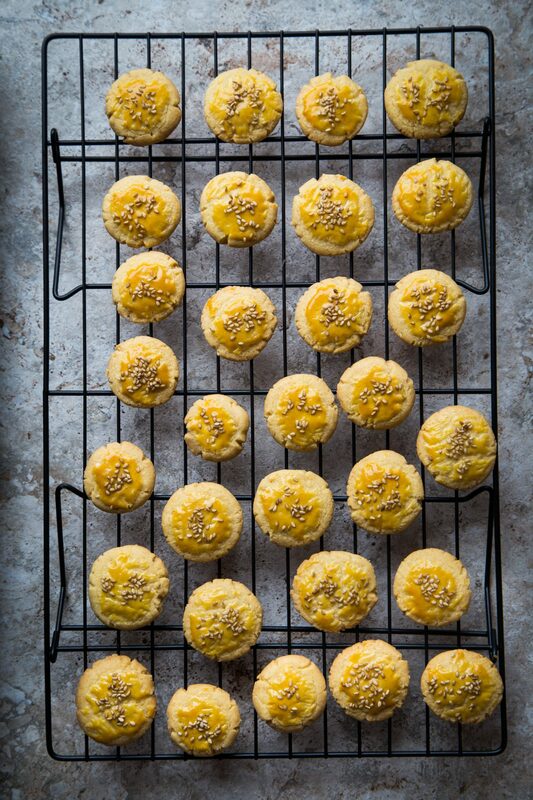 I understand it might be a little hard to understand how something like salted egg yolks in cookies can be tasty, especially if you have never tasted salted egg yolks on its own! Crazy people in Asia can’t stay away from this thing!!! (including me!). Aww…I love this little hands!!! my 4-year old little hands!! 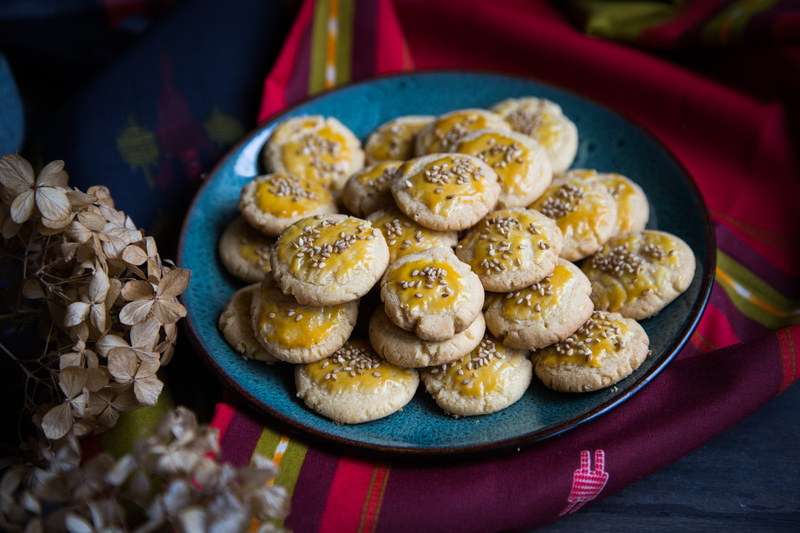 Soft buttery cookies are infused with the salty umami salted egg yolks to give you sweet, salty, and crumbly cookies. 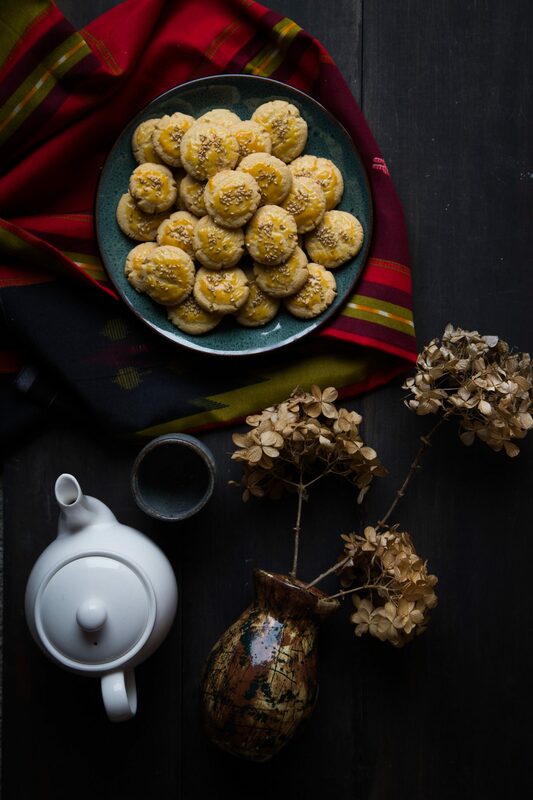 One of the popular cookies for Chinese New Year celebration. So interesting and attractive. Keeper definitely. Thank you so much ! Id love to try this. Can milk powder be substituted or left out? Also, can we use knors salted egg powder instead? You can left it out. I’ve never tried it with the knorrs salted egg powder, I would leave it out if I were you. Hope this helps! What a unique idea, thank you for this. I have never tried salted egg yolks myself so this should be interesting. I’ll let you know. 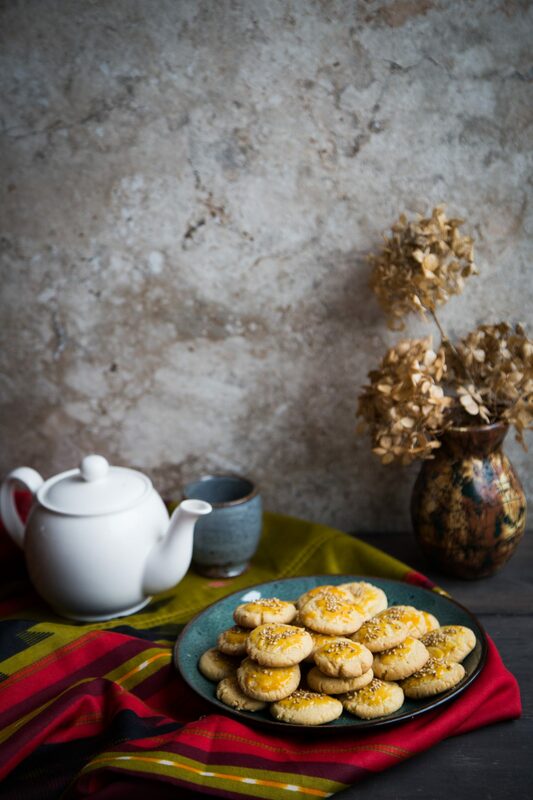 Hi Richard, I know it sounds so weird, but salted egg yolks actually adds a very nice umami flavor to the cookies. Please let me know if you tried salted egg yolk 🙂 I’d love to know what you think.